BUFFALO, N.Y. -- The University at Buffalo volleyball team put forth one of their most impressive wins of the season on Friday evening as the Bulls swept Kent State 3-0, in front of 506 fans at Alumni Arena. The victory improves UB's record to 15-10 and 7-6 in MAC play with three regular season matches remaining. The Bulls took the contest, 25-17, 25-14, 25-18, as they held Kent State to a -.051 hitting percentage, the lowest by a Buffalo opponent this season. The Bulls on the other hand hit .215 for the night. The first set was close for the first half as the Bulls held a 14-13 lead midway through it. However, from there UB scored four straight points as a solo block from sophomore Andrea Mitrovic gave UB the 18-13 lead, forcing a Kent State timeout. Back to back kills from Kristina Nieves and Polina Prokudina extended the lead to 23-16 and UB clinched the set on a Kent State attack error. Buffalo had its most dominant set in the second as the Bulls forced Kent State into 10 hitting errors as the Golden Flashes hit -.125 for the set. UB jumped out to a 12-4 lead and they never looked back. With UB leading 22-14 late, the Bulls rattled off the final three points getting a kill from sophomore setter Tia Gleason, followed by a block from Nieves and Prokudina and then a Nieves kill clinch the set at 25-14. In the third set, Buffalo held on to a narrow 8-7 lead when they scored five straight points, capped off on another block from Nieves and Prokudina, giving the Bulls the 13-7 advantage. The Golden Flashes cut it to 16-14, but the Bulls answered by scoring four straight as a bad set from Kent State put Buffalo ahead 20-14. 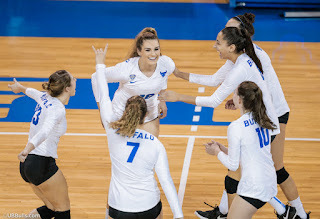 With the Bulls ahead 21-18, UB scored the final four points, as Prokudina and Gleason each had a kill and Mitrovic had a pair, including the final one to clinch the match. As a team, the Bulls held Kent State to just 18 total kills for the night, while on the other side Buffalo registered 45 kills. Mitrovic led the Bulls with 11 kills, while senior Megan Wernette finished with nine kills and Prokudina had seven kills and just one error. Junior Rachel Sanks added seven kills, while Nieves and Gleason each had five. Gleason also finished with 34 assists and a service ace. Defensively, the Bulls had 54 digs, led by 10 each from freshman Paige Beck and senior Larra Bickelhaupt. Junior defensive specialist Hannah Watson added nine, while Gleason had eight. The Bulls added 7.0 total blocks on the night, led by four from Wernette, including a pair of solo blocks. Buffalo remains home tomorrow evening for another crucial conference match as they welcome the Ohio Bobcats into town. The match is set for 6pm and it will air on ESPN+.